This week we focus on some strong trend driven collections and quality street wear basics with hoodies, crew neck tops and sweatshirts for men. Hoods, sweats and crews are the easy-going, “no sweat”, quick-fix style to casual street wear, and we at Apache have a wide range oozing with timeless cool. Expect the finest from the Italian garment manufactures of Franklin and Marshall because first up is the all-American Franklin and Marshall Zip Through Printed Hood Sweat. Here is a quality zip up hoodie that features an open zipper fastening and a kangaroo style pocket to the front. You’ll be sure to stand out in this winter ’14 sweat from Franklin and Marshall with its vibrant snowflake style pattern on the hood’s interior; a unique design that sits well in either the diamond blue or grey melange colourway. A plain and simple hoodie like this is perfect for balancing out a patterned tee like this one. 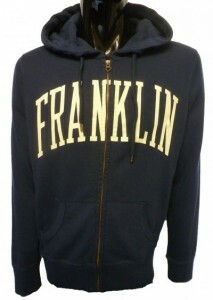 Also inspired by the American collegiate lifestyle, is the varsity Zip Through Franklin Logo Hoodie by Franklin and Marshall. Produced in Italy and inspired from the famous US university, this is the ever popular and classic, ‘Franklin’ arched script print. The athletics and campus style hooded jumper comes in a semi slim fit. Team it with a pair of Franklin and Marshall’s tracksuit joggers to cosy up for this cold winter season. Try the Cotton Sweatpants in Navy or Grey Melange. Next up, adopting urban and modern British swagger is, Money Clothing. Established in 2003, Money has become a fresh brand which recently exploded onto the high street scene, becoming choice of fashion. Check out this Foil Ape Crew Sweatshirt that adds to our Apache Online collection. This is a regular fit sweatshirt which features a crew neck collar, cuffs and hem. 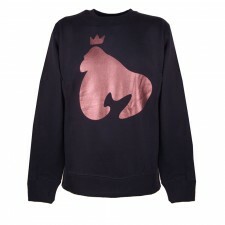 The predominantly black sweatshirt presents the bold ‘king ape’ graphic in a contrasting foil material. It comes with a soft fleece lining and a branded metal tab applied to the left sleeve. Otherwise, switch it up for the new Ape Metal Badge Crew Sweat, now on sale at £60. This jet black sweat by Money features a simple minimal design to the front, with two angle snap fastening pockets and a branded metal tab. To the back, is the signature Money typographic print in rich golden foil. Match your Money Clothing sweatshirt with more foil graphics from the Money brand with either the Richie Rich Logo T Shirt or the seriously bold typographic Signature Ape Logo T Shirt in jet black or true blue. 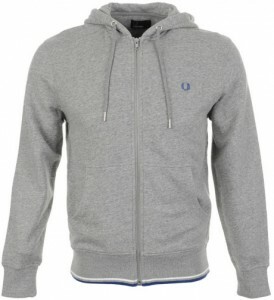 Fred Perry serves another ace with this regular fitted Tipped Zip Through Hooded Sweat, made from pure cotton. 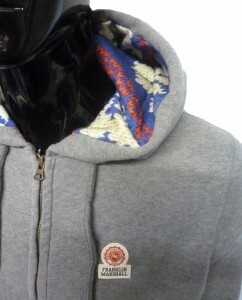 Once again, Fred Perry’s sports and street wear collection has utilised pattern and colour simply and effectively; notice that the twin tipped blue and white welt detailing at the hem of this Vintage Steel Marl grey hoodie matches the small blue embroidered Fred Perry Laurel Leaf logo on the chest. First choice for the discerning Apache customer! Take a look at the hooded sweat also in Dark Carbon at Apache Online, UK.